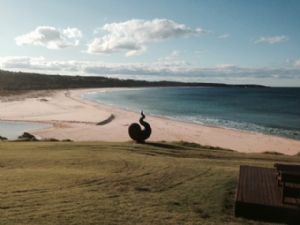 Bega Valley Shire Council is inviting the community to celebrate the positioning of Ross Cameron’s wonderful sculpture Tidal Spiral at Merimbula’s Short Point. The celebration will take the form of a community yoga class on Saturday 19 September at 11am. Just bring a yoga mat or towel, wear sunscreen and a hat and bring a bottle of water. There will be a beginners’ class suitable for both adults and children. The class will be led by local Yoga practitioner Meredith Dolan, a Yoga Teacher and Body Harmony Teacher living in Merimbula. She is passionate about yoga and the health and healing that comes from the practice. The sculpture was the winner of this year’s Sculpture on the Edge acquisition prize sponsored by Council. Photograph: Ross Cameron’s award winning sculpture, Tidal Spiral at Merimbula’s Short Point.